The countries Lithuania, Latvia, and Estonia lie on the Baltic Sea coast. They have highly developed industries, modern agriculture, and interesting arts and crafts. The Lithuanians and Latvians belonging to the Baltic ethnic group, and the Estonians of Finho-Ugric descent, settled in this region in the third-second millennia B.C. Over the centuries they have developed a distinctive culture, of which traditional folk arts are a considerable part. Wood, clay, flax, wool, copper, silver, and amber, the wonderful gift of the Baltic Sea, were the favorite materials used by their urban and peasant craftsmen. These raw materials were, and are still today, made into remarkable works of art, which are intrinsic parts of their culture and life. 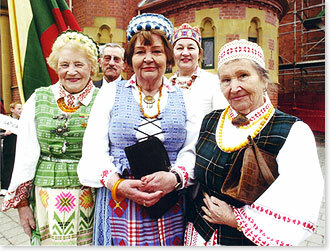 Even their choir music festivals, in which thousands of singers participate, attest to the Baltic peoples' devotion to their cultural heritage. Loyalty to tradition is also evident in their folk arts. They are practiced by both individuals and organized teams of craftsmen, who blend the traditional with the novel in their work by incorporating professional artistic innovations. Baltic art is popular abroad as well as at home due to the many professional and folk art exhibitions that have been held in many foreign countries. These exhibitions have helped to demonstrate the flourishing Baltic region's cultural life to the world.